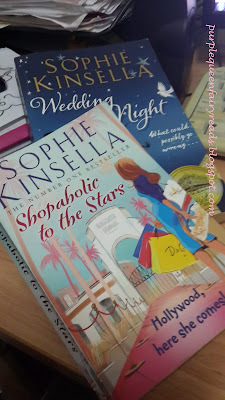 I am ecstatic to have new books to add to my collection, especially to my Sophie Kinsella collection. First, there's Wedding Night which is a totally stand alone book with new characters and the more prized book would be Shopaholic To The Stars which is the latest in the Shopaholic Series where Becky Brandon (nee Bloomwood) is in Hollywood! It takes off from Mini Shopaholic which I read three years ago so yes, I am extremely happy to have this in my collection. If you are new to the Shopaholic Series. it would be nice to read it from the first book which is The Secret Dreamworld of a Shopaholic (also published as Confession of a Shopaholic) but even if you don't it's quite alright as well. I just read Wedding Night and review of that is coming right up. I can't wait to sink my teeth into Stars but I think I want to wait a bit for when I can give my time totally to Becky which I can't at the moment so yup, do keep an eye for my review on it.